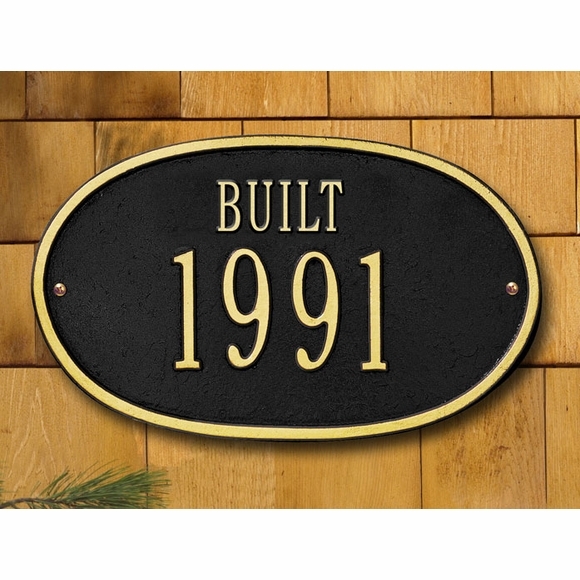 BUILT Sign -- personalized with the year you specify. Made in USA. 12.5" x 7.5" oval historic plaque shows the year in which a building was built. Holds four 3" numbers under the word BUILT. Shown above in color BG (black with gold characters and border). You can also purchase this historic marker with the word FOUNDED, CIRCA, or ESTABLISHED (see Related Products). This is an excellent product. It is heavy and meant to withstand the weather and came with easy to understand instructions for installation. I am very satisfied with the product and the order and shipping service.